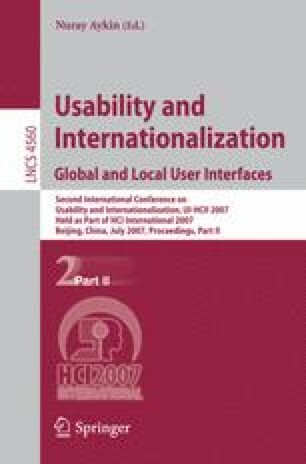 Language effect (Chinese vs. English), and power distance between evaluator and user in usability test were investigated. 12 participants from China, Swede, and Denmark formed 7 evaluator-test user pairs. Test users were asked to use a software. Evaluators were asked to conduct the usability test, and try to find usability problems. Participants’ conversation, behaviour, and screen operation were recorded by behaviour observation system. Results showed that Speaking Chinese made evaluator giving more help in detail, and encouraging users more frequently; Speaking English asked evaluator and user look at each other more often to make themselves understood, and evaluators paid more attention to check task list. Power distance also had effect on evaluators and users. When evaluator’s title were higher than users, evaluator would pay more attention to users’ doing, not like to give user detailed instruction, usually loose communication with user, and spent less for task management. In contrast, talking to evaluators with higher rank, users tend to use more gesture to express themselves.